Happy Toning Thursday, Blossoming Mommy and Baby Community! Today I am SO excited to share one of my all-time favorite running brands with you (Mizuno) and a few gorgeous pieces from their Breath Thermo lineup! First things first, Mizuno, THANK YOU for sending a special running package up here to Alaska. With temperatures dropping to single digits, I am so thankful for the arrival of all things #breaththermo! Ladies, this shirt is everything. First- adorable colors. I received the black- which in my books is a staple color for all workout outfits. This top is absolutely beautiful and fits the body in a flattering, yet form fitting manner. Many workout tops can grab our mid-section in an unflattering and awkward stance. The breath thermo base layer? Not one bit! This base layer fits wonderfully- like a glove for your top half. This base layer is also lightweight (NOT BULKY) and has a gorgeous crew neck design with a color reflective front/back component for SAFETY during early morning or night runs! Secondly, after taking this beauty out for a few afternoon runs, I did not experience any chaffing or abrasions (standing true to Mizuno's anti-abrasion statement!) Added bonus? The uber light-weight + heat-generating vibe. Overall, I would rate the breath thermo base layer crew a solid 10+/10 and highly recommend it for my running Mommas! Ahhh... the #breaththermo gloves! First- this name. LOVE, LOVE, LOVE. Second, the style..absolutely adorable, modern, and FRESH. The first feature that stood out to me with the WARMALITE gloves was the touch screen forefinger (index finger). For my fellow Mommas who LOVE a good podcast or music during runs, this feature made it a DREAM to navigate the iPHONE screen without taking off my gloves. If you live in a cold state, you know this is a TOTAL must. Second, the storage pocket (located on the upper part of the glove) is an excellent hideaway for a few dollar bills (post-run coffee anyone? :) ) or other small items. Again- such a convenience! Lastly, the breath thermo fleece kept heat generating and my fingers warm throughout each run and came laced with BLACKLITE reflective color- similar to the base layer. All in all, I would rate the WARMALITE gloves a 10+/10- making them an absolute MUST on your Christmas list this year. Mizuno, thank you again for allowing me to sample out your BREATH THERMO lineup! 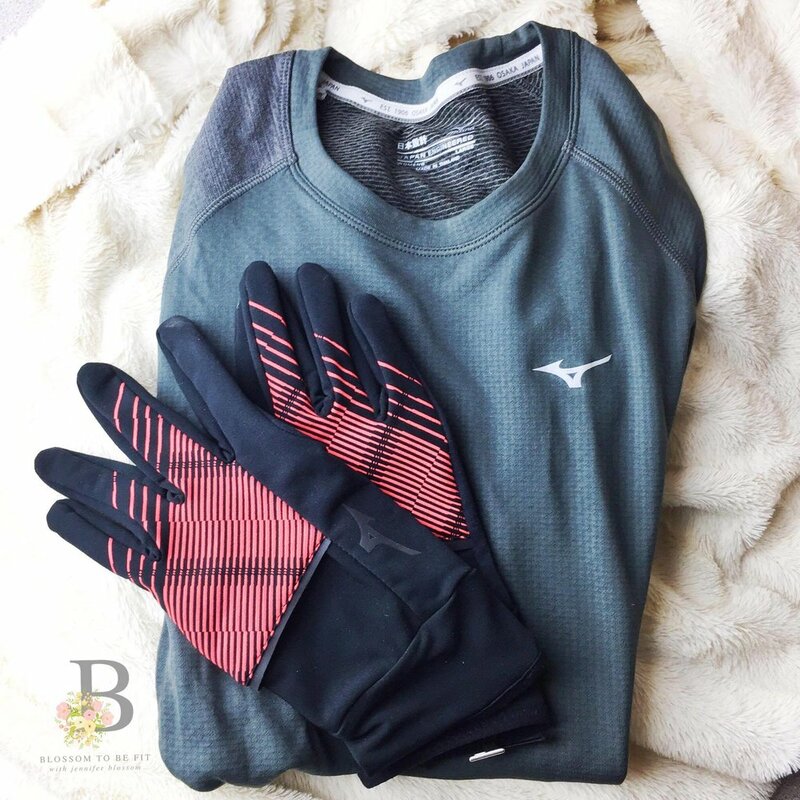 I absolutely LOVED each piece and highly recommend both the base layer and gloves to any fellow Momma runners looking to vamp up their running collections!